Full expiring name badges, once activated, will automatically expire with the word "void" appearing in red multiple times across the entire badge. Full expiring name badges are available as adhesive or clip-on name badges. The adhesive version is activated and applied directly to the user's clothing. It features a textile-friendly adhesive so that it will adhere to clothing without damaging it. 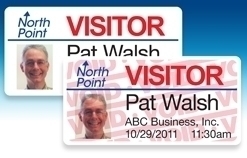 The clip-on name badge is designed to be used with a cardboard backing which both activates the expiration feature and allows the name badge to be used with a lanyard or clip. It also opens the door to further customization and color-coding options. DuraFast Label Company carries full expiring name badges for the Primera LX400 color name tag printer and Seiko direct thermal label printers such as the Seiko SLP610 and Seiko SLP650. Browse our selection of full expiring name badges.